The traditional cejilla is made of wood. This one is ebony with a felt pad. 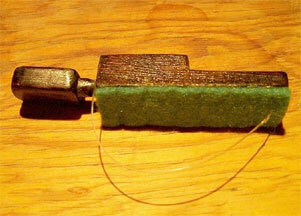 The nylon string is tightened around the instrument neck with a friction peg. My guess is that this type of capo is almost as old as the guitar - perhaps late 1700's. Still in use by Flamenco guitarists. You can buy them at Andalucia Store and Fine Fretted String Instruments. Here is an old cejilla from about 1830, probably French. "This makes sense, as the very earliest form of guitars use wooden tuning pegs (apart from watch-key guitar mechanisms, tuning machines didn't come in until about the 1820's). If you look at my capo, it uses exactly the same principle as the wooden tuning peg. A technology very well known to them." Ebony with mother of pearl inlays. Pictured in a mailorder cathalogue from Schuster & Co, Germany. Around 1920. Note the arch on this ebony cejilla from around 1920. Mailorder cathalogue picture from Zimmerman, Germany. 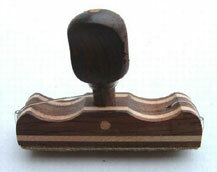 Cejilla made of oak wood, an ebony violin peg, leather pad and a nylon G-string. Made in 2001 by Iorgulescu Radu, Roumania. The next five cejillas from Madrid and Malaga were made in the 1950-70's. They are made of ebony. 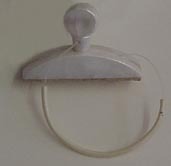 Some have a piece of leather or plastic tubing attached to the string for neck protection. A small model for ukulele. Of course cejillas are made of plastic too. Plastic tubing around the string. This one has a rubber pad under the bar. Unusual ebony cejilla with the screw attached at the end of the bar. The screw hole has a brass insert to prevent the bar from cracking. Leather pad and plastic tubing around the string. Here is another with the screw attached from the side. Leather pad and neck protection. A veriety of exotic hardwoods are used for the bar. Made by Yusef Kabbani (USA) who designed it in 2004. Marketed by: Strings By Mail and Flamenco Connection. 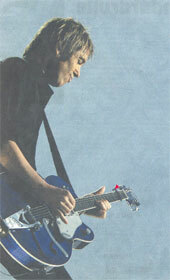 This one is made by Froy Guiterrez, Mexico. A problem with traditional cejillas is that they sometimes snap open by accident in the middle of a song. This brass cejilla has a locking mechanism that prevents that from happening. Note the release button on the right side. The strap is tightened with a movable lever which fits in different notches on top of the bar. Here is a model where the strap is fastened with a buckle on the other end of the bar for better adjustability. US patent 1965 by James Dunlop. 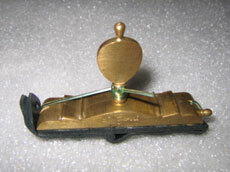 A German variation of the Dunlop capo. The lever is not removable. Instead there is a hook on the buckle. Gould's idea is to make capos that fits both curved and flat fretboards. 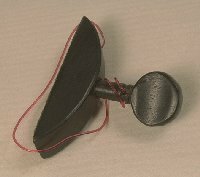 The rubber bar is stiffened by a yoke around the edge. The side where the yoke comes together bends easier than the other side. If you have a curved fretboard, this side should be lined up against the fret. US patent 1981 by Terence Gould (England). 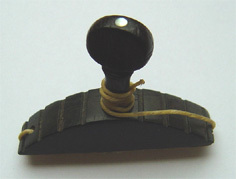 A plastic variation of the Dunlop capo. The rubber pad is straight along one edge, but becomes gradually more curved toward the other edge. 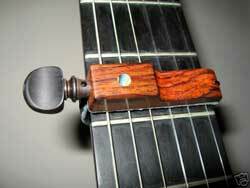 This capo is made from a vareity of hardwoods. It has two rubber roller bars that rolls over the strings for fast key changes. 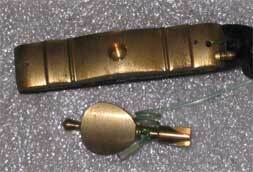 The spring roller pins conforms to the shape of the fretboard whether it is flat or curved. The lever/buckle fits into the cavity on top of the capo and is locked into place by a gravity feed pin. In the other end the strap is fastened to a coil spring. US patent 1983 by William G Welsh. This capo has a screw and nut attached at the end of the strap. The screw fits in a notch at the end of the bar. Preferably the screw is placed at the bass side of the instrument neck. The bar is made out of thin sheet metal with a cork pad. No patent found (the patent application was probably withdrawn). Here is a brass capo based on the same idea. Cork pad. The leather strap is rivited to the end of the bar and to the flat base of the screw. Note that the screw shaft is flattened to prevent it from twisting. Designed to interfere as little as possible with the hand. The excess of the bar never sticks out on the treble side. 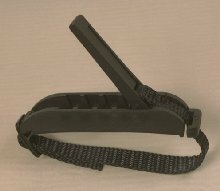 The steel spring strap is coated with nylon, for neck protection and to reduce friction for better distribution of the pressure on the strings. Flexible nylon bar adjusts to different radii of the fretboard (the spring extends through the bar). 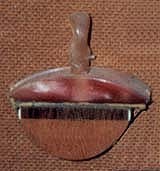 Easy removable polyurethan pad. Snaps on/off and pressure is adjusted with the nut. Strings can never be pulled aside, because the instrument neck is seated in the stiff corner of the capo before the strings are pressed down to the fret. 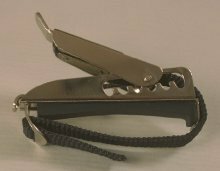 Marketed by Sterner Capo Mfg. Here are three different banjo capos, home made out of cable ties. All are stiffened with stainless steel wire under the silicone rubber tubing. The one on the left is the kind of tie that can be opened and reused. The two blue are modified regular ties. 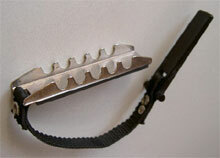 The clasps are cut open on the outside so they can be opened by mild force. For easier adjustment the inside locking mechanism is destroyed on the right capo and replaced by a nut fitting the tie. 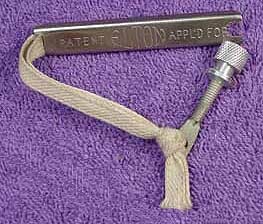 In 1989 a cable tie capo was patented in US, but I have never seen or heard of any on the market. They are probably too easy to make yourself to have any comercial potential.